Emulator of Atari 2600 video gaming console was the first emulator that I've made and it has been almost four years since the first Pantheon, which included 48 Atari 2600 games, was released. Pantheon now has more than 400 Atari 2600 games in its library, and I plan to add more games for the next release. Atari 2600 was very popular for years and has hundreds of games available. Despite the fact, that its hardware capabilities were quite poor (128 bytes of RAM), programmers soon learned how to push its hardware's capabilities and made some incredible and unique games. Activision released Dolphin in 1983, and the game was not very successful. 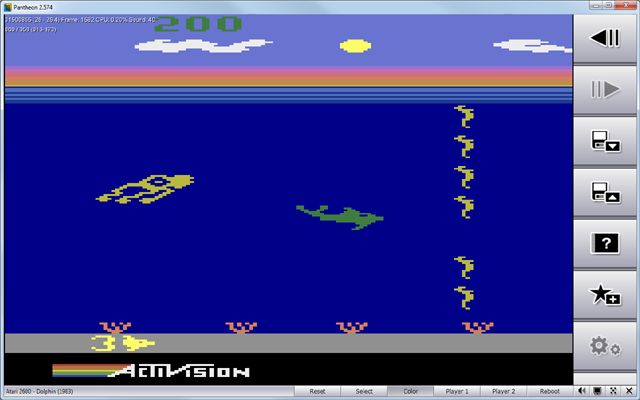 It is fast-paced action game, where you control a dolphin, haunted by a giant squid. There are barriers in the sea and if you hit a barrier, you will slow down for a moment. There is a gap in each barrier, and you must swim through it, but the game is fast and you will not have a time to react, once the barrier comes on screen. So you must focus on the tone, that is played a few seconds before the barrier comes on screen: the higher the frequency of the tone, the higher the gap in the barrier will be.